Johnny Heathcote was a nippy, goal-kicking rover who was recruited from Ulverstone in north-west Tasmania, on the recommendation of former Carlton Best and Fairest winner Arthur Hodgson. Hodgson had coached the Robins to a hat-trick of flags in 1955, ’56 and ’57, and was convinced that his star rover had the skills and the drive to make his mark in the VFL. Heathcote didn’t take long to impress at his new club, and played his first senior game in a 50 point victory over Geelong at Princes Park in round 3, 1958. It was one of the few highlights in a grim year for the Blues, who languished on the middle rungs of the ladder most of the season and finished up seventh. In his 16 matches for the year, Heathcote kicked 19 goals – and remarkably, headed the Blues goal-kicking table by two from fellow rover Doug Beasy. In 1959, aided by the emergence of future champion ruckman John Nicholls, and a group of quality recruits including Heathcote, Sergio Silvagni, John Benetti and Bruce Williams, Carlton surged into finals contention again by finishing runners-up to minor premiers Melbourne. Heathcote continued to impress – kicking 28 goals in his 17 matches – but an injury late in the year against Hawthorn ended his season prematurely. In his absence, Carlton bowed out of the Premiership race with straight sets losses to Melbourne and Hawthorn. Lingering tensions in the wake of a bitter dispute between Jim Francis and Ken Hands over Carlton’s coaching position didn’t help the Blues morale in 1960, and the club slipped back to mid-ladder finishes in 1960 and ’61. 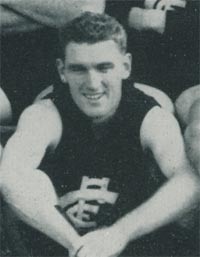 By then, Heathcote was spending a lot of time on Carlton’s reserves bench, and so decided to accept an offer to return home to Tasmania as captain-coach of Burnie. He played his last match for the Blues against Essendon at Windy Hill on Saturday, August 8, 1962. The Blues got off to a slow start and couldn’t peg back the Bombers, who ran out winners by 9 points. In his 69 games for the Blues in guernsey number 37, Johnny Heathcote kicked an impressive 70 goals – but he wasn’t quite done. Rounding off a fine career, he captain-coached Burnie to the 1963 Tasmanian State Championship. John passed away in June 2008. On July 5, 2013 John Heathcote became the 269th player inducted into the Tasmanian Football Hall of Fame. NB * This birthdate is different to what is commonly listed in AFL historical information. To understand why, click on the below Blueseum Article link. Contributors to this page: WillowBlue , Bombasheldon , molsey , tmd1 , PatsFitztrick , Jarusa , true_blue24 , nikki , steve and admin . Page last modified on Tuesday 16 of July, 2013 08:21:16 AEST by WillowBlue. 1985 Rd 19 - Wayne Blackwell, player of the round. The Buzz snaps for goal.